There’s a common idea amongst serious photographers that it’s a good idea to always have a camera on you, because you never know when you’ll see the stuff of a great picture. Seeing as how it’s often impractical to always have an SLR or other larger camera with you, many photogs adopted smaller point-and-shoot cameras they could easily toss into a bag or even keep in a pocket. In the digital age these are often called “serious compacts,” because they offer enough control for the experienced photographer without being enormous. In fact, many photographers over the years have argued that the moment a great photo happens is far more important than the gear you use to shoot it. That’s why many will contend that your camera doesn’t matter or that the best camera is the one you have with you. While these ideas seem to be quite common in still photography I don’t often hear them repeated in video circles. It could be that photos and video often are thought of differently, or perhaps serious videographers look upon video shot in the moment to be too much like bad home videos to be taken seriously. Or maybe it’s because it’s a very recent occurrence that there are video cameras that are as small as compact still cameras. Home video camcorders are about thirty years old now, but for the first ten years of their existence they were big shoulder-mounted affairs. In the 1990s the birth of 8mm, VHS-C and then miniDV led to so-called “palmcorders.” Yet, they were still a little bigger than most film SLR cameras. That is to say, one might take it on vacation to record special moments, but only a dedicated few would take one on a walk through the park or to a party. In the early 2000s there were several miniDV camcorders shrunk down to about the size of a couple of paperback books. While this seems to have encouraged more folks to carry camcorders with them, the relative delicacy of their complex tape mechanisms and the need to carry blank tapes still served as discouragement from keeping one in your bag all the time. By 2005 the ability to record video crept into most point-and-shoot digital cameras. At this point I think a lot of average folks started to take more video, primarily because it was simple and built into the camera they were hauling around anyway. But the quality of the video still was lacking compared to a decent dedicated camcorder, often with much poorer sound. So while many more videographers played around with their digicam’s video function, it doesn’t seem like they were taken too seriously. Now we’re finally at the point where there are good camcorders that will fit in your pocket. Whether it’s a Flip cam, a Sanyo Xacti like I use, a point-and-shoot digital camera with HD video or even an iPhone 4 it’s possible to shoot quite credible video using a device only slightly bigger than a miniDV videocassette. Thus begins the era wherein serious videographers can indulge in taking “video notes” of daily life and events in the way still photographers have been doing for decades. I’ve realized that’s the real value to small camcorders, having the ability to easily shoot video without a lot of planning and schlepping. As a result I think I’ve shot more video with my Xacti VPC-CG10 in the last year than I shot with my miniDV camcorders over the previous nine years. 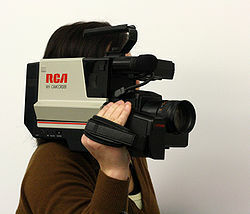 The miniDV camcorders, as relatively small and easy to use as they were, still required more forethought and planning, along with carrying an extra bag for the camera and tapes. What I’ve really enjoyed is shooting short “slice-of-life” videos that last no more than a few minutes once edited down. Not coincidentally, this is the perfect length to share on the web. So I also think that having the ability now to share HD quality video so easily on the web contributes to the value of the pocket-sized camcorder, where before the venues to share such video widely were quite a bit more limited. I’ve got quite a bit of video in the queue waiting to be edited. Luckily, sometimes I end up with a solid 3 minutes that requires minimal editing. As an aside, while I still lament the lack of a proper microphone input jack in most small camcorders, I continue to be amazed at the quality of the sound recording in my Xacti VPC-CG10. It truly rivals the quality of dedicated digital audio recorders like the Zoom H2. The Xacti doesn’t quite measure up at the low-end, and emphasizes the midrange a little more than I’d like. But a little equalization cleans that up pretty easily. I now notice that the new Sanyo VPC-PD2 that I wrote about yesterday sports some fairly serious looking microphones that I am curious to hear. Here’s a short video I shot of the classic post-punk band Mission of Burma at the Wicker Park Fest street fair here in Chicago a couple of weeks ago. This was shot hand-held from the crowd in the street. There was no room for a tripod or monopod. The only reason I was able to grab the video was because I had the camera in my bag and could easily grab it. I’m able to hold the Xacti much more still than a Flip style camcorder because of it’s pistol-grip design and flip out screen which makes for a more stable two-handed grip. The sun was starting to go down so I switched the CG10 into black and white mode which I think works better in low light. I accidentally underexposed it a little, as I’ve learned that the LCD screen isn’t the most accurate way to judge exposure, so I had to boost the gamma in post. This makes the video a little more contrasty in a way that I like and is more film-like, but it may not be everyone’s cup of tea.